Thoren Vadala, owner of Make-A-Frame Atlantic Limited, posing near frame samples. This is the third entry in a series of interviews looking at longtime businesses that have consciously adapted their business model to the changing retail environment. Jonathan Marable sat down with Thoren Vadala, current owner of Make-A-Frame Atlantic Limited (180 Atlantic Avenue), to learn about taking over an existing business and expanding to new locations. [Jonathan]: Thoren, thank you for taking time to talk with me. Can you briefly describe Make-A-Frame for the readers? [Thoren]: Essentially, we do custom picture framing. However, what we actually do encompasses so much more, as we are helping our customers frame their most cherished items and memories for posterity. We have framed a wide range of items, from prized posters to a child’s tooth. We also frame, display, and sell works from other artists and collaborators. We outsource work such as restoring and preserving to a collection of specialists mostly in Brooklyn that I have come to know, but when it comes to framing, we are and have long been this neighborhood’s go-to place. I consider myself very fortunate to have been able to acquire such a gem of a business. [Jonathan]: Yes, indeed! Could you tell me a bit about yourself and what led to you acquiring this business? [Thoren]: In 2003, I was living in Seattle and I kept hearing great things about Carroll Gardens in Brooklyn. I decided that it was time to go find out what the hype was all about. So I packed up my bags and moved to an apartment on State Street. I soon got involved in a number of interests such as video editing, graphic design, printmaking and sound production. I figured that New York was the best place to try all these interests out and blaze my own path. On a whim after about six months, I dropped off my resume at a custom frame shop down the street called Make-A-Frame. To my surprise, I got a response 11 months later. During the initial interview, I hit it off with the owner at the time Tom Shoemaker. By the time we finished, he not only hired me but also offered to hand over the business to me in five or six years. His manager of 16 years was leaving at the time, and he also wished to retire. 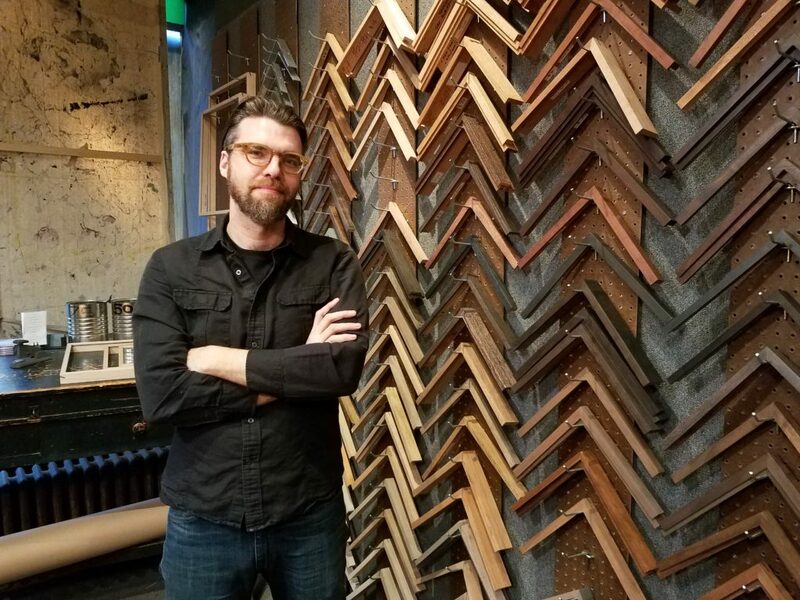 I began at Make-A-Frame in February of 2004, learning the ropes from the then-owner, and a few years later [in 2010] he sold the business to me. Then, as they say, the rest is history. [Jonathan]: Yes, and your business has a long history in the community as well. I would love to hear more about it. Could you share some of its highlights and lowlights? [Thoren]: Inspired by do-it-yourself custom frame shops found in his hometown of Chicago, Tom Shoemaker opened Make-A-Frame in May of 1978. At first, it was a large and well-known operation, with three locations, ads on buses, and even a mascot that would appear in ads. However, he ended up closing two of the locations in the 1980s due to rising rents. In his view, he would rather close the stores than pay higher rents. Right after 9/11, as insurance rates increased, Mr. Shoemaker decided to get rid of the do-it-yourself component of the business altogether. It seems that cutting glass, metals and wood were deemed potentially dangerous activities for customers to do on their own. (Thoren chuckles.) This left framing and the building of frames to the trained professionals. Not that it wasn’t available before–as it always was–but for a higher price. However, it took some time for regulars to learn and understand that Make-A-Frame was no longer a do-it-yourself frame shop. Though that was before my time, this shift was okay with me, as I generally prefer to work on the higher end, more-intricate work involved in making frames. However, I was around for the Great Recession, which surprisingly led to a tremendous spike in business for Make-A-Frame. Bars and restaurants were closing left and right, but my business actually thrived! I have thought long and hard about why this might be. Apparently, according to an article in WNYC, Benjamin Moore in particular also did very well in 2008, particularly in Cobble Hill. My theory is that people were staying at home more in order to save money, but this gave them time to work on home projects that they had put off for some time. And so people did. [Jonathan]: We understand that you now have a second location. Did that changing consumer behavior contribute in any way to your decision to shift your business model? [Thoren]: To some extent yes, but not fully. Opening a new space first crossed my mind when I heard that the large chain Michaels was opening up down the street. [Editor’s note–The development of 252 Atlantic was announced in 2007 as an apartment building; eventually the plans evolved to include large retail footprints. The Michael’s store was first announced in 2015, with the opening in 2016.] Since they also sell frames, I thought they would be a competitor, but as it turns out, business has increased since they opened. Who would have thought? I guess it might be that our products target different markets; Michaels sells cheaper frames that are often made elsewhere, while my frames cater to those who don’t mind shelling out a bit more for better quality frames. The larger impetus for me getting another space was to expand my capacity for building frames. The new place is on Bedford Avenue in Bedford Stuyvesant, not Williamsburg. It is bigger and has a large workspace in the basement for me and my employees to build and store empty frames for my Atlantic Avenue location. It has also allowed me to expand my customer base further into Central Brooklyn, as people can get items framed there as well. It also happens to be close to where I live now with my wife and children. I have a daughter that is almost three years old and a son that is almost eight years old, so being close to home makes it easier for my wife and I to juggle responsibilities with the kids. Though I have owned the Atlantic Avenue location for eight and a half years, I have only had the new space for three and a half years now, including six months I needed to customize it for operations. It was my first big push as Make-A-Frame’s new owner, and though it is sometimes stressful to manage both locations it has proven to be a great move. The hope was to allow the catchment areas of my businesses to overlap and cross the Flatbush Avenue divide to serve a broader market. The Atlantic Avenue location allows me to serve Carroll Gardens, Cobble Hill, Boerum Hill, and Brooklyn Heights. The Bedford Avenue location allows me to serve Clinton Hill, Prospect Heights and Crown Heights as well as Bedford Stuyvesant. Fort Greene is where the catchment areas overlap in a Venn Diagram-like fashion. [Jonathan]: You said that your business attracts customers that prefer a different product than what they might get at a big-box store. Considering the changes that are happening here and in Central Brooklyn, how else would you describe your typical customer at this point? [Thoren]: Well, it is tough to narrow down to one particular type, but I would say my customers are in their 30s and above with disposable income. The items that people bring to be framed have not changed that much, though what they tend to bring are larger, more intricate, and varied than in the past. I find that word of mouth is the most effective marketing tool for me to reach customers, even more so than social media or other digital presences. I also display art pieces in the windows, which draws the eyes of potential customers walking on this heavily-trafficked portion of Atlantic Avenue. For about three years I had a working relationship with the creative director at the chain Bonobos. He sought to add some local flavor to his stores, and outsourced the buying and framing of art to me. The framed art I selected has shown up at Bonobos stores in 10 states, but my biggest influence has been on the one at 173 Court Street. If you go there, you will see pieces from local artist Steve Powers a.k.a. ESPO in wooden frames I made myself. I have also framed concert posters made by Mike King for bands local to each of 20-some odd Bonobos locations. I enjoy exploring and trying new things. 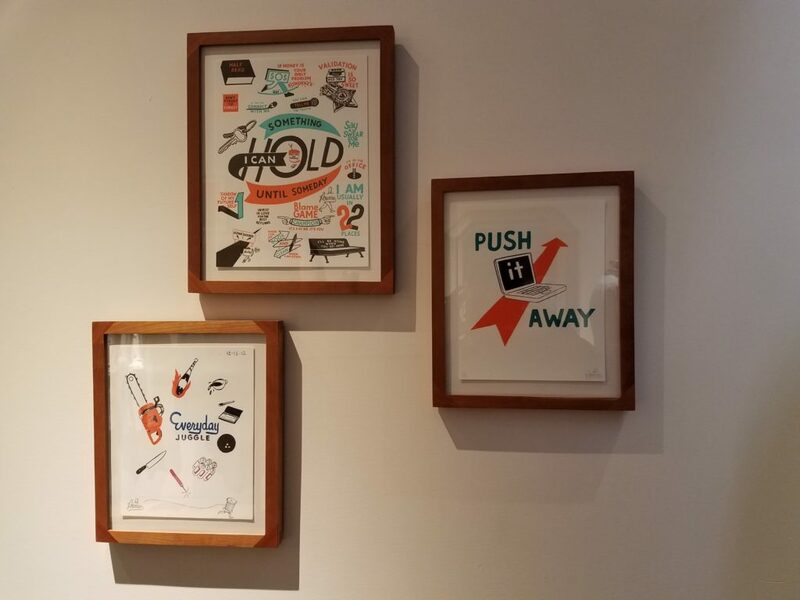 Art pieces by Steve Powers, framed by Thoren Vadala, hung in the Bonobos Store at 173 Court Street. [Jonathan]: Make-A-Frame has been around for a long time on Atlantic Avenue, yet the business has constantly reinvented itself. What would you describe as Atlantic Avenue’s identity, and how has it changed? [Thoren]: Honestly, it is tough to say what Atlantic Avenue’s identity is right now. Though Atlantic Avenue has changed quite a bit, some aspects have remained the same. Back in the 1940s there used to be a streetcar rail line that ran down the street. It still remains a corridor where tons of cars and trucks travel today. Most of the Middle Eastern businesses that arrived decades ago are still here. They were smart, and saved up enough to buy the buildings their businesses occupy. I know the government is crafting legislation meant to help preserve legacy businesses. At 40 years in existence and in the same place, I would like to think of Make-A-Frame as a legacy business. [Jonathan]: What advice would you give to those looking to open or operate a business here on Atlantic Avenue–or anywhere? [Thoren]: For those looking to take over an existing business, you should first join as an employee, and stick around to learn how things are done. Also, keep your eyes and ears open for new opportunities and influences. I have friends who started their own businesses. What worked best for them is collaborating with like-minded individuals to start businesses that offer goods and services that complement businesses and skills you and your associates already have. Start from a position of strength. There is a Japanese concept called ikigai, which is a state of stability and life satisfaction achieved by balancing certain factors. To reach it, you must have an even mix of what you love, what the world needs, what you can get paid for, and what you are good at. I feel I have reached it with what I do now. [Jonathan]: That is great to hear! Thank you for sharing with us your experiences, your reasoning for opening a new location, and your take on what has changed. Thank you again for your time, and see you on Atlantic! Follow this business on its website and stay tuned on social media for images of merchandise and updates on programming.